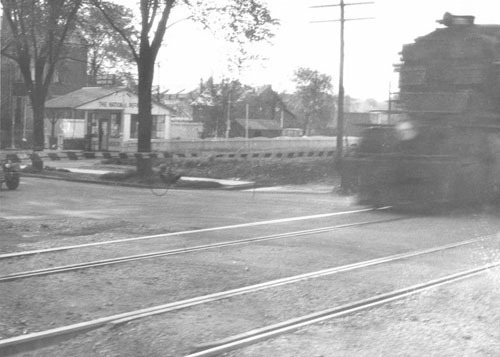 A big N&W articulated steam locomotive is crossing E. Broad Street one of the ten grade crossings eliminated by the 1930 project. The locomotive probably has a long string of empty coal cars that will tie up several road crossings as it slowly picks up speed leaving the Joyce Avenue yard behind. The camera is looking toward the northwest. Photo from the Dave Bunge Collection. The politicians and business leaders of the 1910s and 20s did Columbus a good turn when they promoted and sponsored the Norfolk & Western grade elimination project. The N&W's mainline located near the Columbus border with Bexley is the site of beautiful Franklin Park and many nice homes. Before the track was elevated slow coal trains would block important east-west Columbus arteries like Broad Street and Main Street for extended periods of time. The N&W crossed the joint Pennsylvania/Baltimore & Ohio Railroads joint four track Columbus Newark Division Mainline at grade level just north of Maryland Avenue. 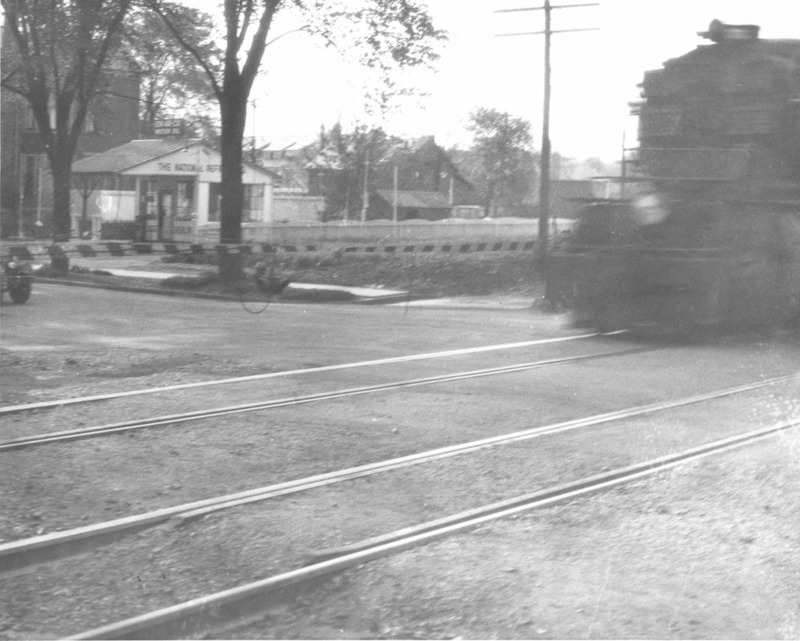 Coal trains would often be held waiting for clearance to proceed north into the Joyce Avenue Yard prolonging the blocking of automobile traffic all the way back to East Broad Street. As an extra benefit raising the track tended to lift the locomotive coal smoke helping to move it along out of the adjacent neighborhood. With the growth of vegetation on the fill the tracks were screened from view (not necessarily an advantaged to the rail fan) and train sounds were muffled mitigating that irritant of having a busy railroad so close to parks and homes. The railroad, of course, was the big beneficiary with an enlarged rail yard, no more waiting at the PRR/B&O crossing, no more grade crossing accidents with automobiles and no more gripping politicians. This was a win-win for everyone. The selects on the left lead to N&W magazine articles that describe the project both before work started and how it looked when completed. The slide photos bring you to 2013 to show that the bridges are still in great shape after 83 years of service.